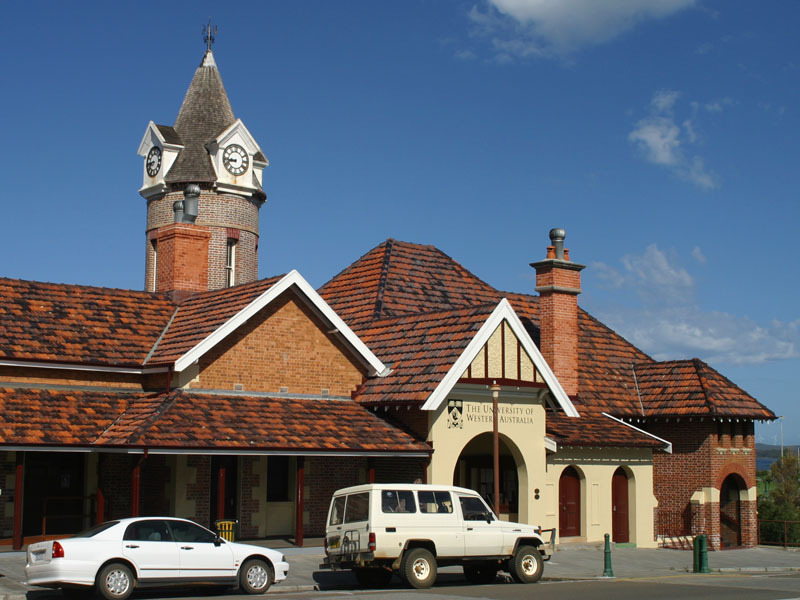 The Federation Heritage of Albany W.A. Google map of Albany W.A. 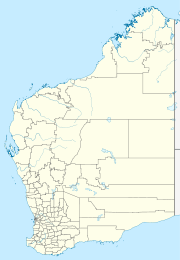 A brief history of settlement of Albany W.A. 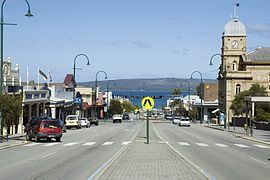 Exploration of the coastline around what is now the thriving regional centre known as Albany began in 1627, when Dutchman Pieter Nuyts sailed the ‘Gulden Zeepaardt’ through the Great Australian Bight. Successive explorers included George Vancouver, who entered and named King George III Sound in 1791, but was unimpressed with the area’s soil. A decade later Matthew Flinders arrived here and, in 1803, Nicholas Baudin sailed his ship into King George III Sound, leading one of a number of French expeditions to the area. Whalers and sealers working the Southern Ocean were also frequenting the area by the 1820s. Frenchman Dumont D’Urville’s visit in 1826 was a driving factor which inspired the British to formalize their possession of the area, a plan that had existed for a number of years. Another reason was to establish a penal colony in Western Australia, as there was a desire to close the Port Macquarie (NSW) convict station, although this did not eventuate. On the 9th of November 1826, Major Edmund Lockyer, together with a contingent of convicts, soldiers, a surgeon and storekeeper, left Sydney aboard the ‘Amity’ bound for King George III Sound. The Amity arrived on Christmas Day 1826. Lockyer selected the site of what is now known as Albany for the crown and thus formed the first Western Australian settlement. Major Lockyer named his new town ‘Frederickstown’, after King George III’s second son, His Royal Highness Prince Frederick Augustus, Duke of York and Albany – ‘The Grand Old Duke Of York’. An example of the design skill of George Temple Poole, Government Architect in the 1880s when the building was constructed as a Hospital. The building demonstrates a skilful use of architectural elements and typifies the early style of Temple Poole’s public buildings through a use of dressed limestone and timber shingles. 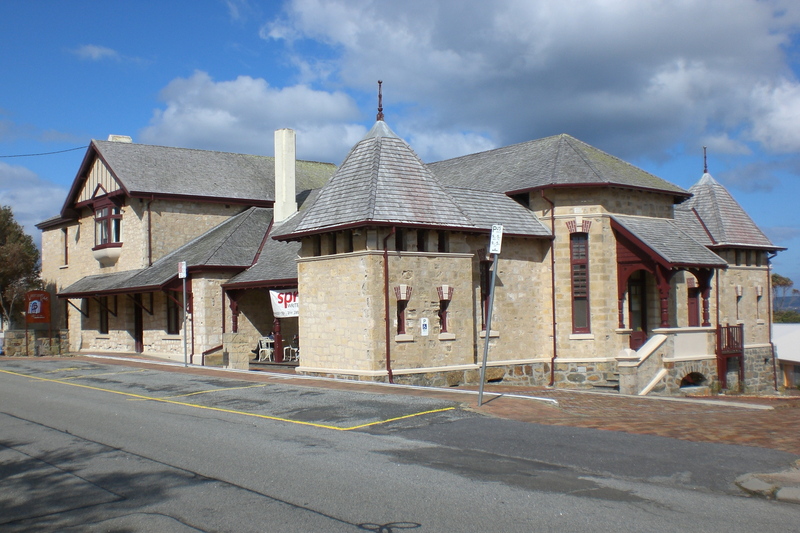 The building has importance in the historical context of Albany’s development as a regional centre which began with its initial settlement in 1827. The building typifies the style of public buildings built by Temple Poole during the late 1880s – dressed limestone walls, shingled roofs, turrets, ornamental woodwork and a keen concern for grouping and composition of all elements of the building. The building was extended in the 1930s and again in the 1950s. The most recent major addition occurs along Vancouver Street extending eastwards from Temple Poole’s building. This addition is constructed in brick, the top section being rendered, with shingled roof. The original section, built as a shelter for cab drivers, was the gift to the community of lawyer Frank Rawlings Dymes and his heiress wife Ellen Belinda. Expanded to include a women’s rest centre and public toilets. This building was originally established between 1906 and 1913 as a shelter for cabmen in the horse and buggy days, by Mrs Dyme, wife of a prominent lawyer in the town. In 1926 the taxi rank was extended to include a women’s rest room. A picturesque building, it is socially important for its role in the town’s history. 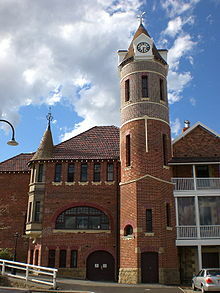 One of Albany’s most interesting buildings architecturally and historically. Originally used as a Customs House, Post Office and Telegraph Office. It was also used for local Government meetings, theatrical performances, debates, lectures, concerts, socials and even Church services. The building was constructed in two stages. The first section was constructed in 1869 to the designs of J. Manning. Local bricks were used with freestone dressings. The roof was covered with she-oak shingles. George Temple Poole designed the 1896 section, which was constructed of bricks, freestone, Albany granite and cedar. There is an impressive stone geometrical stairway in Sydney bluestone. 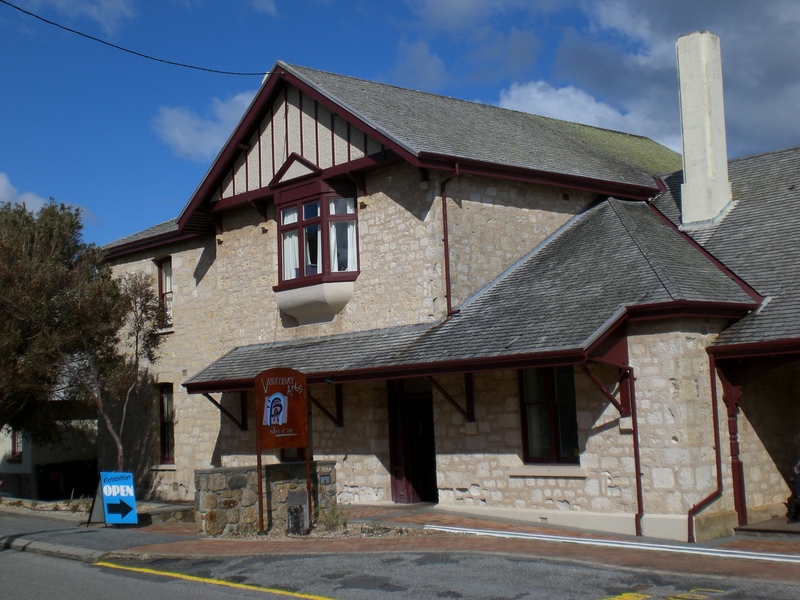 In 1875 the building was used as the base station for the intercolonial telegraph linking Western Australia to Adelaide. The main building was constructed in two stages, the first in local materials such as brick, granite and sheoakshingles, the second also included materials imported from New South Wales. 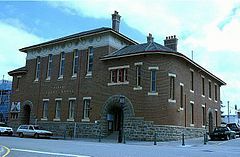 The original building was completed in 1869, after requests from the Government Resident to the administration in Perth, Western Australia. Large scale site works included excavations, by convict labour, and a large granite retaining wall up to 5 feet thick. The design by James Manning, the Clerk of Works, now forms the eastern section of the building. The Albany State School opened in 1896 at the Serpentine Road site that is now the Albany District Education Office. A Junior or Infants and Senior school were on the same site for nineteen years. Designed by George Temple Poole, Government Architect? The Albany Local Education Office is situated at 85 Serpentine Road, Albany. Teachers visiting this site will find local resources that will expand their knowledge and understanding of Aboriginal perspectives that will enhance their teaching experience. 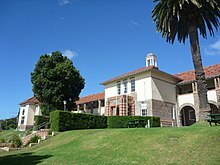 The school first opened in 1918 at Serpentine Road, above, and relocated in 1924 to the northern side of Mount Clarence, to buildings designed by the Principal Architect of Western Australia,William Hardwick. This outstanding federation home is an impressive property with an amazing amount of attributes that are going to appeal to the most discerning buyer. Located in one of Albany’s historic precincts this grand home has lovely harbour views and the location enjoys an elevated outlook over the attractive grounds of Lawley Park and the neighbouring Lawley Park tennis courts. 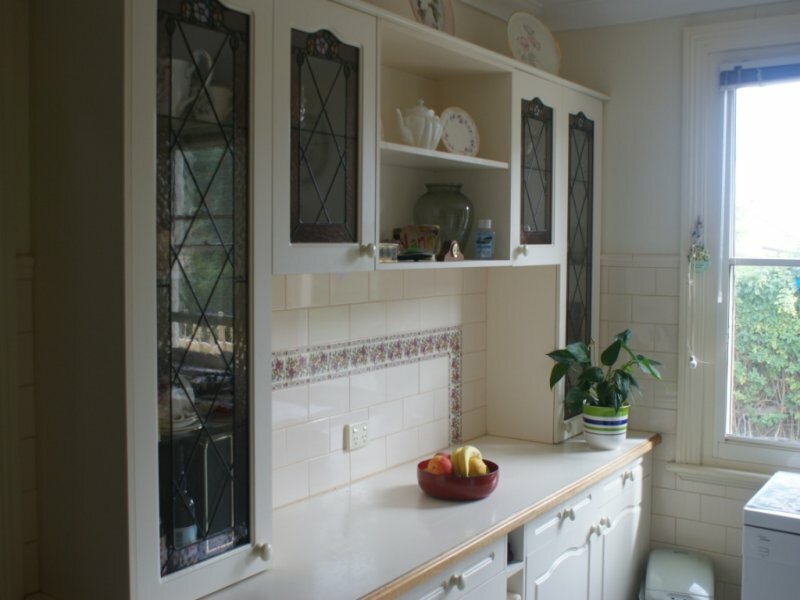 This property has been lovingly cared for and maintained over the years. The gardens and grounds all on 1009m2 are manicured, reticulated and attention to detail has been given so they are in keeping with the era of the home. The entry to the home is via a grand staircase leading onto the verandah that takes in the outstanding views on offer. 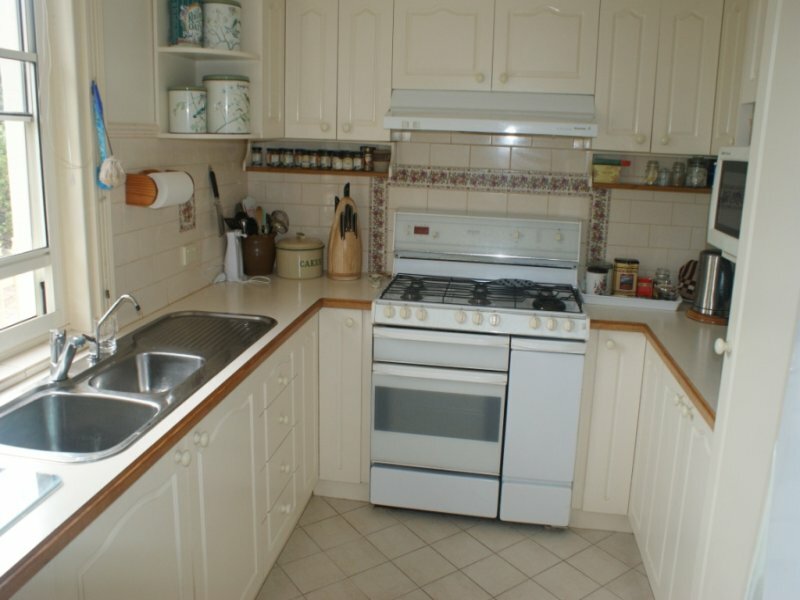 This charming home is in excellent condition and has undergone extensive internal and external renovations in recent times all in keeping with the Federation style. The home enjoys a formal dining room, lounge room and a kitchen dining area that is central to the property. The master bedroom is generous in size and includes an ensuite and direct access to the lovely gardens via French doors. The home also has the added bonus of reverse cycle air-conditioning keeping the home cool in summer and warm in winter. A remote access gate keeps the rear of the property secure and an oversized single garage with an abundance of storage also compliments the property. Thomas Wilkinson-Howe, who arrived on the ship “Dudbrook” in 1853, originally owned the land on which this house was built. He became sole proprietor of the property in 1883. The following year, part of the title was transferred to John Robinson, who was a prominent Albany businessman at that time. In 1891 he sold Lot 160 to Samuel Haynes, a prominent Albany lawyer, who held it until 1903. The next owner was Annie Challend, who commissioned William Mawson, an Albany Master Builder, to build a residence in 1903. Annie Challend lived there until 1920 and after Annie’s death in 1924; her son Walter became the new proprietor until 1937. Available records show that the Clapp family owned the property until 1959. It is thought that this house was considered an “Establishment” house, ie. part of the banking-maritime-cultural circle. Research indicates that it was used as a venue for musical soirees and choral society events. An early photograph of the house, from the collection of WE Mawson, Master Builder, shows it was originally face brick, with the stucco being added at a later date. 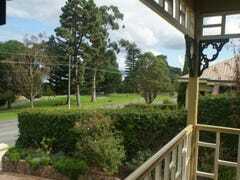 The timber valance was once across the whole verandah. 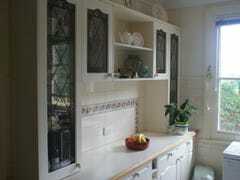 Almost all other features remain intact, including some original glass in the bay windows. Some red glass in the internal hall door has been identified as French flash glass made only between 1880 and 1890. Unsympathetic extensions to the rear were replaced by the present owners in 1994-95 with one more in keeping with the ace and character of the home, while incorporating some of today’s comforts. 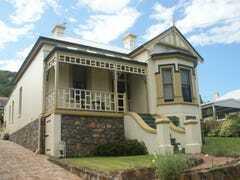 The Rocks Albany is the only five star heritage accommodation in Western Australia. With six beautifully appointed guest rooms, magnificent gardens, unobstructed views of Princess Royal Harbour and indulgent gourmet breakfast, The Rocks Albany is the perfect decadent getaway. Formerly a vice regal residence of Western Australian state governors, this historic home captures hearts with its regal style, impeccable service and grand surrounds. Situated on the slopes of Mount Melville overlooking Princess Royal Harbour, this is a truly incomparable heritage listed building. “The Rocks” is synonymous with the hospitality of a bygone era, rare grandeur and decadence without ostentation. The main east facing, stain glass door is the entry statement into the most enviable of entrance halls, dwarfing you with its proportions and impressing you with its Victorian styling and original jarrah floorboards. The original Australian Red Cedar staircase, carpeted in Victorian style, showcases the simple but elegant style displayed throughout the building. Heritage Place No. 15443Parkville is a substantial two storey residence with high streetscape value. The residence has aesthetic, historic and representative heritage significance. Parkville was built in the colonial period as a Georgian style, two-storey cottage. (It was seen in a photo in 1863.) The house was thought to have been originally built for the residence of the Head Gaoler at the gaol, and then situated over the road in Lawley Park. It was extended in the 1890s for retired Point King lighthouse keeper, Samuel Mitchell, who intended to operate a guesthouse. It was during this renovation that the Federation façade was added. Since the 1890s it has been used as some form of boarding or guesthouse. During the Great Depression years both the top and bottom verandah areas were enclosed for extra accommodation. At this time it became a 14-bedroom establishment. In World War II the guesthouse was used as Rest and Recreation accommodation for visiting American submariners. After the war the house was converted to a girls hostel to lodge country girls who came to Albany for either school or work. In 1994, it was called the “Colonial Guest House”, owned by David and Chrisitne Duvall. Purchased by the Malcari family in 1995, the dwelling continued as a guesthouse until converted into a private residence in 1998. Arthur and Heather Malacari spent much time and effort sensitively restoring the house including building the verandah and gable on the west side of the residence. Heritage Place No. 15445This timber house (Glen Affric House) has streetscape value. Though the integrity of the hose has been compromised by changes, the house still has aesthetic, historical and representative heritage significance. This house was built c1898 according to the 2000 owner of the property. It was originally called Ivanhoe House and in 1904 operated as a guesthouse. When new owners took over in 1975 they could not register Ivanhoe House as some one had already used that name, the alternative, Glen Affric was chosen. Glen Affric is a Scottish name. Heritage Place No. 4297This house has an interesting story behind it’s construction. Originally built in c.1900 the upper part of the house was extended an 1916 and then again in the 1980’s. It has aesthetic, historic and representative heritage value. This house was originally a single storey stone building constructed between 1900-1905. It was then extended c1916 when an upper floor of hand-made bricks was added. In the 1880-1890’s a ‘charcter’ extension at the back was added, in keeping with the original stone structure. Two old pine trees, thought to be almost a hundred years old, give the place its name, ‘Whispering Pines’. Two-storey residence, the ground floor built of stone, the upper floor of hand-made bricks. Federation home built around 1900 in central Albany. Corner location on a 921m2 block. The character home is on the State Heritage Register and consists of three bedrooms, separate lounge, kitchen/dining and bathroom. Under the house at the rear is a storage or workshop area. 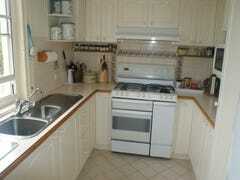 There is an external laundry and a carport and small garden shed. The house has high ceilings, timber flooring and oozes character. It is zoned “Central Area” and is suitable for a variety of uses including offices. This is a Federation Bungalow with streetscape value. It has aesthetic, historic and representative heritage significance. Heritage Place No. 15470The front part of the Youth Hostel, also known as the Backpackers, is a good representative of early Federation architectural style with Victorian influences. Formerly known as Bayview, the house has has a large extension to the rear to accommodate travelers. Bayview was built as a single storey, stone, with rendered brick, residence c1900. It was converted to hostel accommodation by Youth Hostels Australia, who added a large extension to the rear, attempting to suit the character of the building. The building has modern social significance in that it provides accommodation to visitors from a number of different countries, on any given day. Two large chimneys with moulded capping. Heritage Place No. 15479This house was constructed as a town residence for George Moir, a prominent Albany district pioneer. Moir established the ‘Mongup’ property near Borden. He originally owned all of Lots S11 and S12 between Frederick St and Stirling Tce. The house commanded a view of the town jetty and was a good example of sloping block construction with servants quarters and kitchen on the lower storey and owner’s living quarters ‘upstairs’ at the Frederick St frontage. The house was owned by the descendants of G Moir until 1980. Already recognised at the highest level – the WA State Register of Heritage Places. Redevelopment requires consultation with the Heritage Council of WA and the City of Albany. • Provide maximum encouragement to the owner under the City of Albany Town Planning Scheme to conserve the significance of the place. • Incentives to promote heritage conservation should be considered. The house is important as an example of the restrained architecture typical of Albany and as an example of a large house of the period. It is also significant for its association with the mayors of Albany. 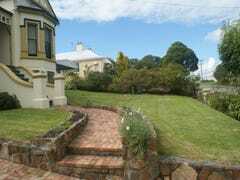 This large two-storeyed stone house with verandahs, “The Rocks”, was built c.1884 on an imposing site overlooking the town and harbour, by William Grylls Knight, the first Mayor of Albany. During the 1920s it was the summer residence of the Governor and was known as Government House or Government Cottage. The Rocks was built in 1882 for prominent local identity, William Grylls Knight and his family. Knight was Mayor of Albany from 1886 to 1888. The Knight family occupied the Rocks until 1910. The last occupant was artist Mary Knight, the daughter of William Knight. The state government purchased the property in 1910 for use as a vice regal summer cottage. Contractor, C D Keyser, made alterations to the home at this time. During World War I the building was used as a convalescent home for wounded servicemen. It continued to provide this service until 1921 when it was again used for vice regal visits. By 1937 the building was no longer needed for the Governor and served variously as a school, maternity and general hospital. It was again used for servicemen in World War II until becoming a private residence in 1944. Since that time the building has had other uses including a hostel. The Rocks remained the property of the state government and in the early 1990s was vested in the Minister of Public Health and used as a hospital. The place exhibits aesthetic qualities that contribute to it being is a fine example of the Victorian Regency style. The place is indicative of the development of Albany during the late Victorian era. The place has a close association with the Grylls family. The place was for a number of years during World War I and II used as a hospital & nursing home for the convalescing of war service soldiers. The place is associated with vice regal visits to Albany. Heritage Place No. 3332This house is one of a number of residences in Grey Street that have significant heritage value both individually and as part of a group. This Federation timber house has good streetscape value and aesthetic, historic, rarity and representative heritage significance. Heritage Place No. 3334This house is one of a number of residences in Grey that have significant heritage value, both individually and as part of a group. Situated in an elevated position, this Late Victorian Bungalow has streetscape value and aesthetic, historic and representative heritage significance. This house is one of a number of places in Grey St that have significant heritage value both individually and as part of a group. This 1880s brick dwelling was built for lawyer, foundation partner of Haynes Robinson, and Legislative Council Member, S J Haynes. Heritage Place No. 15493This house is one of a number of places in Grey St that have significant heritage value both individually and as part of a group. The residence has some interesting built features such as the corner bay window which, is part of it’s distinctive asymmetrical design. Heritage Place No. 15494This house, within close proximity to The Rocks, is an outstanding example of a largeFederation Queen Anne style residence. It has considerable aesthetic, historic, rarity and representative heritage significance. This house is thought to have been built c1880s. It was home to several generations of the McKenzie family. Brothers Hugh, Kenneth and Edward were shipping magnates. Hugh McKenzie (Senior) gave a 121-ton brig, the Brothers to Hugh (Junior). Hugh who at this time was a resident of Albany gave the ship to his brothers Edward and Kenneth. Under Kenneth as the Master, the McKenzie brothers traded with the ship between Albany, America, Fremantle and Tasmania for 10 years. Heritage Place No. 15495In the past the house was linked to the original Albany Hospital in Vancouver St. It housed the Superintendent and was later used a nurses quarters. Some of the renovations reflect this use, for instance the large bathroom designed for use by several persons at once. Large corrugated iron roof with verandah under main roof across front façade. This house is one of a number of places in Grey St that have significant heritage value both individually and as part of a group. It would seem that No 208 Grey Street is what was once known as Lot 257, and historical research done through the Albany Historical Society shows that the original owner was Jesse Ward, an Albany carpenter. Only three weeks later the land was transferred to James Dyer of Perth who rented the house and property to William Webb who had arrived as a convict from England in 1862, when he was 28. He had received 10 years penal service for assault and theft of a key, a pencil sharpener and halfpenny. Webb was known locally as “Old Beetles and Bees” and gave his occupation as Naturalist. He also used to meet passengers from the P & O Liners as they arrived in Albany. Webb was an expert taxidermist and in partnership with naturalist G Maxwell, he collected seeds, plants and specimens for sale and succeeded to Maxwell’s business in Albany. He became noted for his collection of bird skins of the Noisy Scrub Bird and he collected specimens for the WA Government. Other tenants who lived on this property were William Melhuish, who originally came out to WA as a Pensioner Guard on a convict ship. He was discharged in 1861 and then worked as a carpenter and farmer. He lived in the house in 1893, when he was aged 76. Later owners of the property were William Thorley-Loton (a company) in 1904, Henry Dyer in 1911 and Charles Montgomery from 1914 till his death in 1933. Heritage Place No. 15500This house is a fine example of a well preserved home built near the turn of the twentieth century. The local Albany bricks and the cement quoins around corners, windows and door frames are significant features that add to the heritage value of the property. Heritage Place No. 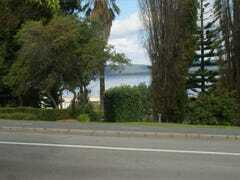 3335This house is set in an elevated position overlooking the Royal Princess Harbour. The house is constructed from granite stone with cement rendered quoins. Built in 1891, the house is an important part of the heritage building stock of Albany. Heritage Place No. 15513The residence at 1 Parade Street is an important part of the historical buildings around the Brig Amity. The Mid Victorian Georgian House was once near the foreshore of the harbour, before land reclamation.The house has significant aesthetic, representative, rarity and historic heritage value. Heritage Place No. 15516According to the advertisement for tenders to build this house, it was probably constructed in c1897 for a Dr Charles Chewings. The architect was Robert P Greenshields. It has aesthetic, historic and representative heritage significance. On 12 December 1896 as advertised in the Albany Advertiser, tenders were called for building a residence in Parade St for a Dr Charles Chewings. Architect Robert P Greenshields called for the tenders. Assuming the eight-room cottage was built soon after this it is thought the house at 14 Parade St was completed in 1897. On 10 February 1909 the Albany Advertiser was again used to advertise the sale of the property, this time by a FW Strother. The notice described the eight-roomed residence that included a bath, pantry, scullery, children’s playroom, large outhouse, gas throughout and all conveniences. The position and view were described as excellent. It is thought that a Mr Meeks purchased the house at this time as he is listed as the owner in the oldest Albany Rates books available, which start in 1911. Heritage Place No. 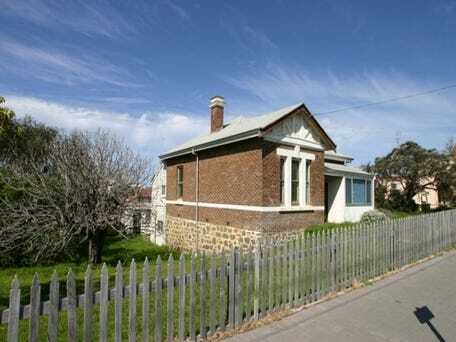 15525Rowley Street has a stock of heritage places that range from the Victorian era through to the Federation period. This house is elevated above the road and is a solid, well-kept example of a Late/Victorian or Early Federation house with a projecting bay wing. During 1992 this house was extensively renovated and restored by owners J and E Rourke. A and M Owens did the building work on the designs of Evan Samiotis. As a result the architectural work was recognised by an Albany Award for Renovation and Extension in 1992. Heritage Place No. 15526Rowley Street has a stock of heritage places that range from the Victorian era through to the Federation period. The house at 4 Rowley Street is an cEarly Federation with Queen Anne influences. The projecting bay wing is an important feature that adds tot he heritage character of this house. Heritage Place No. 3337Built in c1905 this large brick bungalow has streetscape value. The house is a good example of Federation Arts and Crafts style with it’s fine portico verandah and assymetrical design. This house was built by Josiah Norman and Co for a local dentist and social figure Thomas S Merfield/Herfield (sp?). Heritage Place No. 15531This house has a rare design with a central chimney. Extensions tot he rear have been done sympathetically with the character of the house. The house has aesthetic, historic and representative heritage significance. Heritage Place No. 15537This Federation Queen Anne Bungalow is part of a group of places in Spencer Street that have architectural merit. The house has aesthetic, historic and representative heritage significance. Heritage Place No. 3338This imposing two-storey residence has sweeping views to the Princess Royal Harbour. It is a fine example of Federation Queen Anne architectural style with Filligree influences. It is one of a groups of places on Spencer Street with heritage value. Worthy of the highest level of protection. Recommended for entry into the State Register of Heritage Places which gives legal protection. Heritage Place No. 15544This place is one of a large number of important heritage buildings in Stirling Terrace. 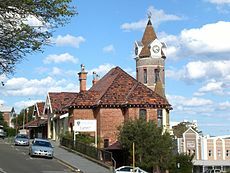 Stirling Terrace is one of the significant Local Heritage Areas in the City of Albany. This former single residence has been divided into two units (1999). 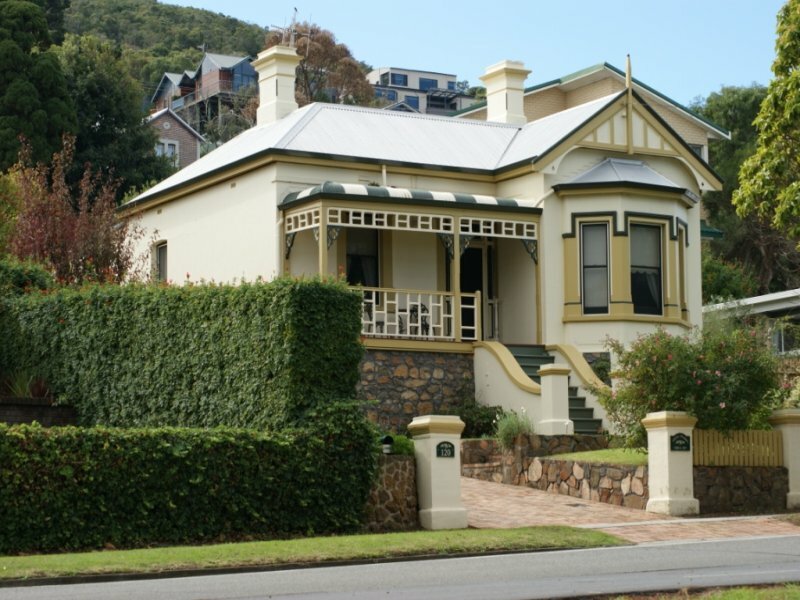 The turn of the century house has high streetscape value in Stirling Terrace, It has aesthetic, historic and representative heritage significance. This residential building is one of a group of significant residences built during the Late Victorian/Federation period in Stirling Terrace. Stirling Terrace is one of the City of Albany’s most significant heritage assets, both as a streetscape and as a collection of Victorian and Federation period buildings overlooking Princess Royal Harbour. Stirling Terrace is located in visually striking topography and its segmented crescent plan form remains basically as it was when first recorded by Surveyor Hillman in 1835. Heritage Place No. 15546This residential building is one of a group of significant residences built during the Late Victorian/Federation period in Stirling Terrace. Heritage Place No. 15561This Federation Arts and Crafts house is built on a corner setting (Cuthbert Street and Vancouver Street). The asymmetrical design complements the corner situation, as it appears the house has two frontages. This house has aesthetic, historic and representative heritage signifcance. Heritage Place No. 3340This place is one of a large number of important heritage buildings in Vancouver Street. Vancouver Street is one of the significant Local Heritage Areas in the City of Albany. Set on stone foundations, this house is a good example of Federation Filigree architectural style. the place is representative of the growth of Albany as a commercial and service centre for the region in the late nineteenth and early twentieth centuries; and, the place was built for Herbert Robinson, Mayor of Albany (1915-1917) and MLA (1917-1919), whose family established the shipping and merchant firm Drew, Robinson & Co in the late 1880s. The large face brick and clay tile, 4-car garage (c.1980s) and the granite front wall and retaining walls (c.1980s) are of little significance. The face brick and prepainted, corrugated galvanised steel roofed rear extension (c.1970s) is intrusive. Heritage Place No. 15563This place is one of a large number of important heritage buildings in Vancouver Street. Vancouver Street is one of the City of Albany’s significant Local Heritage Areas in the City of Albany. This house, in a high position above the street, has been part of the streetscape since the Federation period. It has aesthetic, historic and representative significance. This place is one of a large number of important heritage buildings in Vancouver St. The earliest available records show that Charles Alfred Haslam, labourer, was the owner of this property in 1882 It is not clear when the residence was built. The land subdivide around 1893, and other owners on the title deeds include well known Albany residents Samuel Johnson Haynes (1893), Alexander Robert Richardson (1896), and Herbert Robinson (1911). Heritage Place No. 3929This place is one of a large number of important heritage buildings in Vancouver Street. Vancouver Street is one of the City of Albany’s significant Local Heritage Areas in the City of Albany. This well kept house from the Late Victorian/Early Federation period has the symmetry influenced by Regency design.